In my home, there is no difference. There is no difference between biological, adoptive, or foster child. There are no labels, either. They are all my children. They are loved all the same. As a foster parent of over 50 children the past 13 years, I have found one thing is true. Like all children, a child in foster care has one true wish and one real desire, more than possibly anything else, and that is to be loved. As foster parents, we can protect the child from harm, provide a safe and secure home, offer nutritious meals, and open up a doorway of opportunities for foster children, granting them new and exciting experiences that they may never have dreamed of. Yet, with all of this, with all of the wonderful opportunities and safe environments, foster children really crave love the most. They want to be loved, and they need to be loved. After all, every child deserves to be loved. Children in foster care often come to our homes with a variety of illnesses, lice, scabies, and a host of other problems, due to previous living conditions, as well as neglect. Many times, these children also suffer from mental health issues. These might include anxiety related disorders, Reactive Attachment Disorder (RAD), anger issues, panic disorder, depression, and so forth. To be sure, there are high levels of mental health problems with children under foster care. What they need the most is for me to love them. Despite all their challenges; despite their conditions; despite whatever label society might place upon them. They need me to love them. Unconditional love is simply being loved without restrictions or stipulations. For a foster child who may have been abused, beaten, or neglected, this type of unconditional love is most important, yet probably unknown. Your love as a foster parent is quite essential to the child's health, well being, and future. Without this type of love, a love that does not judge and is forgiving, a foster child will not form necessary and healthy attachment with others, resulting in a number of attachment disorders. Foster children who suffer from these disorders will have great difficulty connecting with others, as well as managing their own emotions, not only during their childhood and time in foster care, but many times throughout the remainder of their lives. Emotional difficulties such as a of lack of self worth, trust, and the need to be in control often result in the lack of unconditional and healthy parental love. As anyone who has worked with foster children will tell you, most foster children face an enormous amount of emotional issues, many times stemming from the lack of healthy love; the love of a parent figure. After all, as a foster parent, I might just be the only adult in their lives who might offer them unconditional love. I hope I'm wrong. I hope that when the children from foster care move from my home back to their birth family, that they are wrapped in love, and are surrounded by it. Sadly, I have found that isn't always the case. Therefore, as a foster parent, each child in my home will be loved with all that I have. 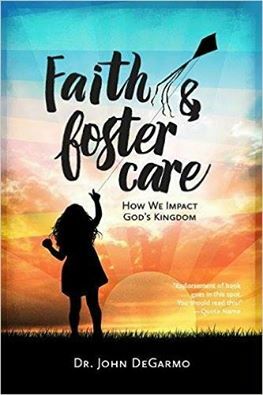 For more on foster children, and foster parenting, buy Dr. John's new book, Faith and Foster Care: How We Impact God's Kingdom.